Sergeant First Class Mark Wayne Jackson was born at Saint Luke Hospital in Saginaw, Michigan to the proud parents of William Alva and Janice Marie Jackson on June 7th, 1962. He spent his youth between Saginaw, Michigan, Bridge Port, Michigan and Swan Valley, Michigan. While growing up, Sergeant First Class Jackson balanced his time between academics, hunting, fishing, football, wrestling and track. He graduated from the Swan Valley School system in June 1981. After graduation, Sergeant First Class Jackson got a job as a mason tender in Tawas, Michigan, and later enrolled in Delta College. Sergeant First Class Jackson started his military career in 1983 with attendance to Basic Training at Fort Leonard Wood, Missouri, as a member of the United States Army Reserve. Additionally, he completed the Motor Transport Operators course and on the job training as an artillery soldier in B Battery, 4th Battalion, 38th Field Artillery at Bad Axe, Michigan. While assigned there he was promoted from Private First Class through Sergeant. In February of 1986, Sergeant First Class Jackson joined the Active Army and attended the cannon crewman course at Fort Sill, Oklahoma, and continued on to Airborne School at Fort Benning, Georgia, as a Private First Class. He was assigned to C Battery, 1st Battalion, 319th Field Artillery Regiment, 82nd Airborne Division, Fort Bragg, North Carolina. While assigned to the 82nd Airborne Division, he attended a Combat Lifesaver Course, Unit Armors Course and Jungle Warfare Training at Fort Sherman, Panama. He was promoted to Specialist in January 1987. In November 1987, Sergeant First Class Jackson was assigned to A Battery, 2nd Battalion, 20th Field Artillery Regiment in Hanau, Germany. He participated in numerous training exercises, attended Primary Leadership Development Course (PLDC), and completed Basic Non-commissioned Officers Course (BNOC). He was promoted to Sergeant in November 1988. In March 1990, Sergeant First Class Jackson was assigned to the 18th Airborne Corps, Noncommissioned Officers Course where he taught PLDC and BNOC and acted as the Reenlistment NCO. While assigned to the 18th Airborne Corps, he was promoted to the rank of Staff Sergeant and attended the Instructor Training Course, Ranger Course, Advanced Noncommissioned Officer Course, and the Jumpmaster Course. In August 1993, Sergeant First Class Jackson volunteered for Special Forces Training. He graduated from the Special Forces Weapons Sergeants Course at Fort Bragg, North Carolina, and went on to complete the Basic Military Language Course for Persian Farsi in August 1994. Certification Course, Aviation in Foreign Internal Defense Course, and the Special Forces Assistant Operations Course. In November 1998, Sergeant First Class Jackson attended the Defense Language Institute in Monterey, California, for basic Arabic and graduated from in December 1999. In December 1999, Sergeant First Class Jackson was assigned to Company A, 2nd Battalion, 1st Special Forces Group (Airborne) at Fort Lewis, Washington, and became a member of Operational Detachment Alpha 142. He served as the Assistant Operations Sergeant for numerous deployments in South East Asia. In August 2002, Sergeant First Class Jackson was assigned as the Operations Sergeant of Operational Detachment Alpha 145. 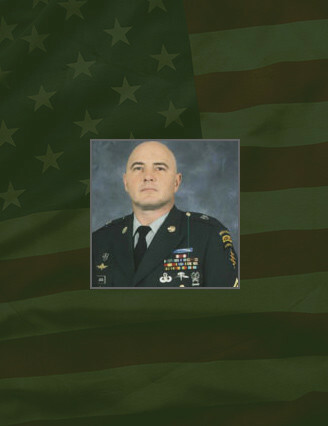 On October 2nd 2002, while participating in Operation Enduring Freedom, Sergeant First Class Jackson was killed in the Republic of the Philippines. Sergeant First Class Mark Jackson was a highly decorated soldier whose awards include the Legion of Merit, Purple Heart, Meritorious Service Medal with oak leaf cluster, the Army Commendation Medal with three oak leaf clusters, the Joint Service Achievement Medal, the Army Achievement Medal with five oak leaf clusters, the Southwest Asia Service Ribbon with Bronze Service Star, the Armed Forces Expeditionary Medal with arrowhead, the Army Good Conduct Medal fifth award, the National Defense Service Ribbon with Bronze Star, the Noncommissioned Officer Professional Development Ribbon with three device, the Army Service Ribbon, and the Army Overseas Service Ribbon. Sergeant First Class Jackson’s decorations include the Expert Infantry Badge, the Master Parachutists Badge, the Military Free Fall Badge, the Special Forces Tab, the Ranger Tab, the Jordanian Parachutist Badge, the Bahraini Parachutist Badge, the Russian Parachutist Badge, the Korean Parachutist Badge, and the Royal Thai Army Parachutist Badge, and the Armed Forces of the Philippines Merit Medal (Posthumously). Sergeant First Class Jackson is survived by his father William, mother Janice, brother Richard, and sister Kimberly.